After getting hit with Daylight Savings Time a few weeks ago and dealing with a 4:30pm sunset...it's been a month of transitions for all of us! I tend to dread this stretch of time when it's dark early and so cold in New England we can see our breath...BUT this year, I'm looking forward to planning more indoor projects and getting creative with my little one! One thing we love to do together is bake/cook! It's fun for me to come up with tasty and healthy snack ideas...then watch her enjoy them! When thinking of two things that London loves...fruit + chocolate came to mind. I mean, you gotta have balance, right?! :) She LOVES citrus-y (is that a word?!) things...so when I saw that CUTIES were back in stores I couldn't help myself and bought a 5-lb box! We will DEFINITELY be eating madarins for days, but maybe it'll bring a little sunshine to the chilly days ahead! Either way, we are excited! Also, side note, they're a great "on the go" snack to grab as you're heading out the door! I like to keep one in my backpack at all times, in case Lo gets hungry and needs something quick! I mean, Moms love that they're healthy + portable...and I think the kids love that they taste sweet! Win for all :) While we're on the topic of food...It's been difficult to get Lo to sit long enough to enjoy a full meal. She loves to snack and "pick" but I really want to keep the habit of having breakfast, lunch and dinner together at the table because it's such a special time! I've started to think "outside the box" and come up with different ways to make meals FUN! The other day, I made her a special "lion" pancake using our Cuties - and her face lit up when she saw it! It's super easy to make and a creative way to start the day! She loved it! I'm always scheduling playdates for London with her little buddies...and there's always some sort of sharing of food that goes on. It's pretty heartwarming to watch them interact and see how they're learning about the power of giving. 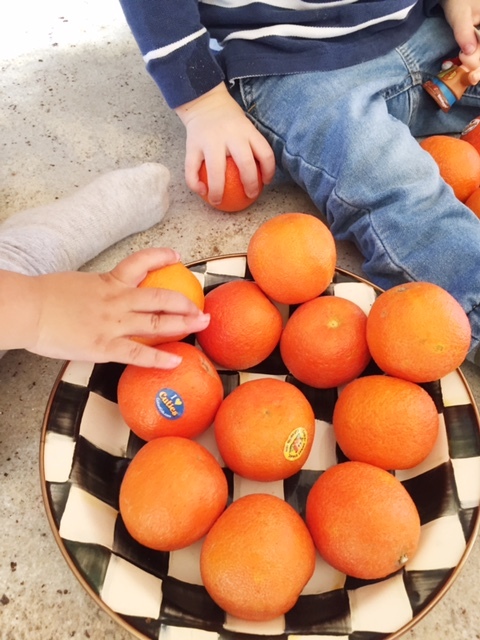 Cuties are such an easy, sharable snack and certainly one that Lo considers "fun" to share with her friend Zach! How adorable are these two? They totally loved having a snack together and Lo even peeled it for Z! So sweet! Grab some Cuties for your "cutie" at a location near you! Directions: Dip half of the clementine in the melted chocolate then place on the parchment paper. Continue and line all side by side. Place in the refrigerator for 10 minutes then serve! This post is sponsored by Cuties. As always, all thoughts, opinions are my own.